A first case in Nigeria was reported by WHO on 25 July 2014: a Liberian man arriving at the city of Lagos by air on 20. July was hospitalised and later died of the disease. No secondary cases have been reported. 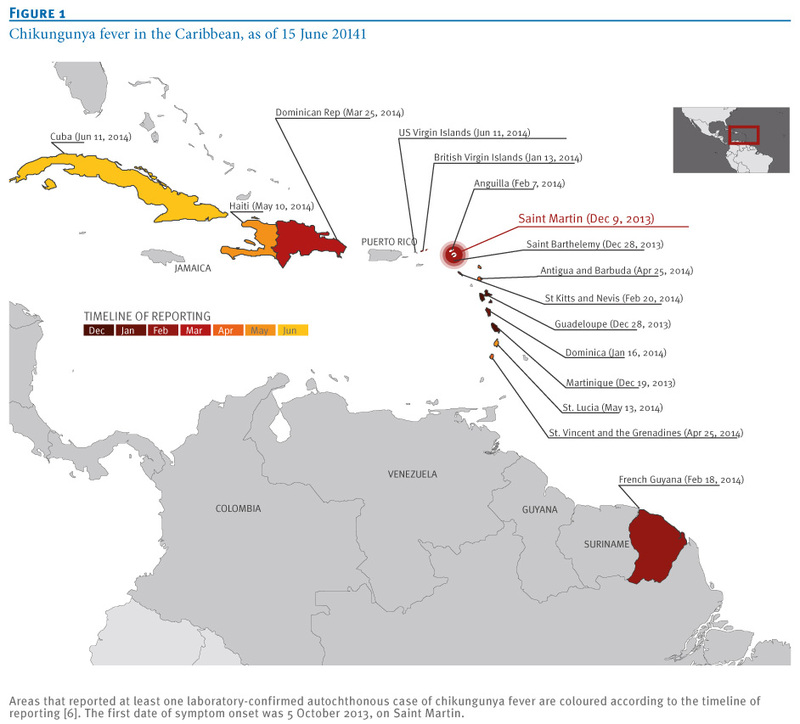 Starting in St. Martin in December last year, the epidemic has quickly expanded throughout the region ( Map). With almost all Carribean islands already affected and the first cases reported from Mexico ( Reference) and Venezuela ( Reference) it can be expected that the epidemic will continue to spread througout Central and South America. Additionally an autochthonous case of Chikungunya has been reported in Florida ( Reference). Imported cases in travelers returning from the Carribean region are currently frequently seen in European countries and the number is very likely to increase. New cases and deaths attributable to Ebola virus disease (EVD) continue to be reported by the Ministries of Health in the three West African countries of Guinea, Liberia, and Sierra Leone. Between 3 and 6 July 2014, 50 new cases of EVD, including 25 deaths, were reported from the three countries as follows: Guinea, 0 new cases and 2 deaths; Liberia, 16 new cases with 9 deaths; and Sierra Leone 34 new cases and 14 deaths. These numbers include laboratory-confirmed, probable, and suspect cases and deaths of EVD. A laboratory-confirmed case of Crimean Congo Haemorrhagic Fever (CCHF) in a UK traveller who was bitten by a tick while on holiday in Bulgaria has been reported. A major outbreak of chikungunya virus infection has been ongoing in the Caribbean since December 2013. The outbreak expanded also in Central and South America. There have been more than 280.000 probable and confirmed cases in the region. At least 22 fatalities have been reported so far. 5. June 2014: cumulatively the total number of cases and deaths attributable to Ebola virus disease in Guinea is 351 (210 laboratory-confirmed, 83 probable, and 58 suspected) including 226 deaths. The geographical distribution of these cases and deaths is as follows: Conakry, 67 cases and 29 deaths; Gueckedou, 194 cases and 146 deaths; Macenta, 45 cases and 27 deaths; Dabola, 4 cases and 4 deaths; Kissidougou, 7 cases and 5 deaths; Dinguiraye, 1 case and 1 death; Telimele, 25 cases and 7 deaths; Boffa, 7 cases and 6 deaths; and Kouroussa, 1 case and 1 death. In terms of isolation, 33 patients are currently hospitalized (8 in Conakry, 9 in Gueckedou, 15 in Telimele, and 1 in Boffa). The number of contacts currently being followed-up countrywide is 1011. One suspected case from nearby Kailahun (Sierra Leone) died in Foya (Liberia). The dead body was taken back to Kailahun for burial. Eleven (11) contacts (5 health-care workers and 6 community relatives) were identified and are being followed up. As of 14 April, Guinea has reported a cumulative total of 168 clinically compatible cases of Ebola virus disease (EVD), including 108 deaths. Six districts of Guinea have reported patients – Conakry (31 patients, 22 laboratory confirmed), Guekedou (95 cases/35 confirmed), Macenta (21 cases/12 confirmed), Kissidougou (6 cases/1 confirmed), Dabola (5 cases/1 confirmed) and Djingaraye (1 suspected case). The date of onset of the most recently identified suspected clinical cases in Conakry and Guekedou was 10 April. One additional health care worker (HCW) has been reported, bringing the total to 16 (11 laboratory confirmed and 5 probable cases). As of 11 April, Liberia has reported a cumulative total of 26 clinical cases of EVD (6 laboratory confirmed, and 20 probable and suspected cases of EVD), including 13 deaths. As of 14 April, Mali has reported a cumulative total of 6 suspected cases, all of whom remain under medical observation (3 in the capital city of Bamako, and 2 in Kourémalé and 1 in Bankoumana in the Koulikoro Region). The results of testing on these patients at the Institut Pasteur laboratory in Dakar, Senegal, are expected shortly. The CDC and the Minnesota Department of Health have confirmed a diagnosis of Lassa fever in a person returning to the United States from West Africa. The patient was admitted to a hospital in Minnesota on 31. March 2014 with symptoms of fever and confusion. Blood samples submitted to CDC tested positive for Lassa fever on 3. April 2014. The patient is recovering and is in stable condition. ( Reference) Note: between 1969 and 2014 approx. 34 cases of imported Lassa fever have been diagnosed in Europe, the United States, Israel and Japan. Almost all cases were physicians, nurses, aid workers, engineers, peacekeepers etc. returning from one of the endemic West African countries. who are currently investigating whether there may be a common source of infection. The mysterious febrile illness circulating since Februrary in the South-Eastern provinces bordering Liberia and Sierra Leone (Guekedou, Macenta, Nzerekorem, and Kissidougou) has now been confirmed to be an outbreak of Ebola. Three suspeced cases from the capital Conakry turned out to be negative for Ebola. Of the 87 reported (suspected) cases 61 have died. The responsible Ebola virus strain was identified as Zaire Ebolavirus, consistent with the high mortality rate observed ( Reference). A suspected case of Ebola in a Canadian traveler who just returned from Liberia and was hospitalized in Saskatoon, Canada turned out to be not Ebola ( Reference). The private IST Medical Scheme Clinic in Dar es Salaam reports an increase in dengue fever cases in Dar es Salaam city. 10 proven cases (with rapid antigen/antibody test kits) have been diagnosed, starting halfway through December 2013 and increasingly so in the last 2 weeks. Most of these patients are expatriate residents in Dar es Salaam. Background: Carbapenems are the preferred treatment for severe infections caused by multidrug-resistant Gram-negative bacteria producing an extended-spectrum beta-lactamase (ESBL). Therefore the increasing and rapid spread of mobile genetic elements that determine acquired resistance to carbapenems and all other beta-lactams in Enterobacteriaceae is of great concern. In 2008, the first case of a novel carbapenemase "New Delhi metallo-beta-lactamase 1" (NDM-1) has been recognised in a Swedish patient who was repatriated to Sweden from the Indian subcontinent. Since this first report, cases involving New Delhi metallo-beta-lactamase (NDM)-producing Enterobacteriaceae have been reported from every continent except Antarctica. Although medical care in the Indian subcontinent was associated with many early reports, recent cases have been described involving persons who traveled to endemic regions but were not hospitalized. The plasmid-carrying NDM is highly transmissible to other bacteria, and bacteria carrying NDM can colonize the gastrointestinal systems of humans for prolonged periods. If colonization or infection of returning travelers, medical tourists or repatriated patients is suspected isolation and early detection is the only way to prevent nosocomial spread. The emergence of these `super bugs´ over the recent years is alarming and considered a serious threat to public health all over the world. Norovirus outbreaks are a major threat for cruise ship passengers (including the crew). One of the worst outbreaks in the last 20 years has recently occurred aboard the `Explorer of the Seas´ where nearly 700 people got infected while cruising in the Carribean. The cruise ship returned to New Jersey early on Wednesday [29. January 2014]. It was not possible to identify the source of the outbreak. The CDC provides excellent surveillance information on recent and current outbreaks of infectious diseases aboard cruise ships: Link. Background: Hanta virus infections occur sporadically throughout the Americas. Hanta viruses in the Americas cause `Hanta pulmonary syndrome´ (HPS) characterized by severe respiratory symptoms. Various Hanta viruses have been identified in North and South America and are transmitted to humans by inhalation of aerosolized dried rodent excreta. Some of the South American Hanta viruses may be transmitted between humans in a nosocomial setting. Currently a larger outbreak of Zika virus infections has been reported in the islands of French Polynesia and Tahiti. The total number of Zika virus infection cases in French Polynesia has increased from 333 confirmed cases and 6630 suspected cases on 9. January 2014 to 361 confirmed and 7156 suspected cases only 4 days later (13. January 2014). What is the risk of international spread of H5N1 virus by travellers? Influenza A(H7N9) is one of a subgroup of influenza viruses that normally circulate among birds. In February 2013 human infections were reported from the Chinese east coast for the first time (see posting from 4. April 2013 below): The first cases were reported between February and May 2013 (n=133), then two cases were reported in July and August, and since October 2013 a second wave of human cases has been recorded (n=74 thus far). As yet, there is limited information about the scope of the disease the virus causes and about the source of exposure. However, most human cases report a history of exposure to birds or live poultry markets. The disease is of concern because most patients have been severely ill and the case fatality rate is considered to be around 33%. Information to date does not support sustained human-to-human transmission. What is the risk of international spread of H7N9 virus by travellers? - 1 confirmed case imported from Martinique in French Guiana. She reported several mosquito bites while grape picking in Fuefuki. She flew nonstop from Frankfurt (International Airport) to Tokyo (Narita International Airport) and [back the same way]. Among several other diseases, dengue fever was suspected, because of the clinical picture. Initially, the 1st serum sample collected 7 days after disease onset gave a positive result in the dengue virus (DENV) IgM and IgG antibody tests (IFA [indirect fluorescent antibody] and rapid test), as well as for DENV NS1 antigen (ELISA and rapid test) demonstrating an acute DENV infection of the patient. Real-Time RT-PCR for DENV RNA and generic flavivirus RT-PCR were negative. After one week in hospital the patient was discharged with a characterization of restitutio ad integrum [total recovery]. A follow-up serum sample was collected in December 2013, because this acute case of dengue fever imported from Japan was considered very unusual. This 2nd serum sample collected 110 days after disease onset revealed a significant DENV IgG titer decrease (IFA) and negative results for DENV NS1 antigen (ELISA and rapid test) and DENV IgM (IFA and rapid test), respectively. A previously healthy 53-year-old man consulted at the Saarland University Medical Center on 22 Nov 2013 after returning from travel to Thailand. During his 3-week round trip (31 Oct-20 Nov 2013), including visits to Phuket, Krabi, Ko Jum, and Ko Lanta, he developed joint pain and swelling on his left ankle and foot on 12 Nov 2013 after several mosquito bites, followed by a maculopapular rash on his rear and front trunk that spread to the face and the upper as well as lower extremities over the next 4 days before fading. Accompanying symptoms were malaise, fever, and shivering, of which the latter 2 appeared only for one day. There have been several cases of poisoning in Indonesia from alcoholic drinks adulterated with harmful substances, particularly methanol. Locals and foreigners have died or have become seriously ill mostly in the islands of Bali and Lombok. In August 2013 15 fatal cases of methanol poisioning have been reported in Indonesia, including a German and a British tourist. Over the years 22 cases of methanol poisoning in tourists have been published. Cases have usually involved local spirits (such as rice-based arak) and cocktails, but brand name alcohol can also be adulterated. From 9. September to 13. October 2013 a total of 159 cholera cases have been recorded in Mexico (V. cholerae O1, Ogawa): 145 cases in Hidalgo, 2 cases in the Ferderal District (Mexico city), 9 cases in Mexico state, 1 case in San Luis potosi, 2 cases in Veracruz state. It is the first time since 2001 that autochthonous cases of cholera are recorded in Mexico. The identified cholera strains are identic to the ones isolated in Haiti. Sarawak, Malaysia: A total of 7358 cases of hand-foot-mouth disease (HFMD) have been recorded in the state from the beginning of the year till 21. September 2013. According to national statistics there were 11903 cases during the corresponding period last year . Kuching Division registered the most cases (1737), followed by Miri (1712 cases), Sibu (1022 cases), Samarahan (550 cases), Sarikei (487 cases), Limbang (387 cases), Bintulu (369 cases), Mukah (346 cases), Kapit (309 cases), Sri Aman (222 cases), and Betong (217 cases). After the death of a man from Rocky Mountain spotted fever in August, the Prefecture of Tombos, Zona da Mata, Minas Gerais has installed 2 warning signs about suspected star tick infestation on the Carangola river. Over the past 6 years, 66 cases of the disease were confirmed in Minas Gerais. Currently TropNet member sites report an sharp increase in travelers diagnosed with typhoid fever after returning from summer holidays (July-August) in Nepal. Florida health officials have issued a health alert Friday as the number of confirmed cases of Dengue fever rose to 12. One new case was just reported in Miami-Dade county, the others were in Martin and St. Lucie counties. - The outbreak of wild poliovirus type 1 (WPV1) in the Horn of Africa, which affects Somalia, Kenya and Ethiopia (see posting from 14. June 2013), has spread into 2 new states of Somalia. Background: Between late July and early August 2013, four additional cases of imported cholera in travelers have been reported: two cases of cholera were reported from Venezuela (a 51 year old male and 55 year old female patient who recently had travelled to Havana) and two cases were reported from Chile (both persons had returned from travelling to Cuba). Currently two cholera outbreaks are ongoing in the Americas: Haiti and Cuba. Haiti: since the beginning of the epidemic (October 2010) to epidemiological week (EW) 32 of 2013, the total number of cholera cases reached 669.645, of which 371.099 were hospitalized and 8.224 died. The global case-fatality rate has been 1.2% since November 2011, however, with variations for example in Sud Est (4.5%) and Port-au-Prince (0.6%). Cuba: in early 2013, there were 51 confirmed cases of cholera in an outbreak in Havana, related to food handling. Previously, a total of 47 cholera cases had been reported, following Hurricane Sandy, in the provinces of Camaguey, Guantanamo and Santiago de Cuba. All cases were characterized as Vibrio cholerae toxigenic serogroup O1, serotype Ogawa, biotype El Tor. Three fatal cases of an hemorrhagic fever have been reported from northern Uganda. Initally an outbreak of Ebola or Marburg hemorrhagic fever has been suspected. Now Crimean-Congo hemorrhagic fever (CCHF) has been confirmed in a survivor who is currently treated at Kalongo Hospital in Agago district, 450 km north of the capital Kampala. Uganda has suffered several episodes of Ebola and Marburg hemorrhagic fever since 2000. Last year two outbreaks of Ebola and one outbreak of Marburg have hit the country (see postings from 17. January 2013 and 14. October 2012 below) ( Reference). Background: CCHF is a primarily zoonotic virus infecting a wide range of domestic and wild animals. Domestic ruminant animals, such as cattle, sheep and goats, are viraemic for around one week after becoming infected. Humans are accidental hosts and get infected via tick bites. CCHF is endemic in Africa, the Balkans, the Middle East and in Asia south of the 50° parallel north, the geographic limit of the genus Hyalomma, the principal tick vector ( view map). CCHF outbreaks constitute a threat to public health services because of its epidemic potential, the high case fatality rate (10-40%), the potential for nosocomial outbreaks and the difficulties in treatment and prevention. The 1st rabies outbreak in Bali occurred in 2008 in Ungasan village. Since then, Bali has gone through 3 stages of mass vaccinations for dogs, monkeys and cats, all of which are believed to be rabies carriers. This year, from April to July 2013, the 4th stage of the mass vaccination is taking place, targeting inoculating 250.000 of the 350.000 dog population. Rabies cases in humans in Bali have been decreasing in recent years, thanks to the mass animal vaccination initiative. In 2008, 4 cases were recorded, while 2009 saw 48 cases. The largest number, 82 cases, was recorded in 2010. After the mass animal vaccination program was launched in Bali, rabies cases in humans started to decrease. In 2011, 24 cases were recorded, and by 2012, only 8 cases had occurred. 11. July: The Ministry of Health in Saudi Arabia has reported an additional laboratory-confirmed case of Middle East respiratory syndrome coronavirus (MERS-CoV) infection in the country. The patient is a 66 year-old man from Asir region with an underlying health condition. He is currently in critical but stable condition. The EpiSouth network published an extensive summary of the West Nile Virus (WNF) circulation in the European region and the neighbouring areas for the seasons 2010, 2011 and 2012. report. On 6. May 2013, the patient (male, 52 years) was bitten on his right hand by a small dog on a compound in Port-au-Prince, Haiti. He had cleaned the bleeding wound with water and alcohol. He had not been vaccinated against rabies before the accident and had not sought medical attention afterwards. The Ministry of Health in Saudi Arabia has announced Three additional laboratory-confirmed cases with Middle East respiratory syndrome coronavirus (MERS-CoV). The first patient is a 42-year-old man with an underlying medical condition from the Eastern region, the second patient is a 63-year-old woman with underlying medical conditions from Riyadh region and the third patient is a two-year-old child with an underlying medical condition from Jeddah. Additionally, four previously laboratory-confirmed cases have died. An increase in dengue fever in returning travelers from Angola was reported from our TropNet centre in Lisbon, Portugal on 14. May 2013: Eight patients were diagnosed in March 2013, 7 of then in the last two weeks of this month; eleven additional patients were diagnosed in April. Patients were residents or travelers to the Luanda metropolitan area, Angola and most of then were Portuguese. Dengue virus serotype 1 DENV1 was confirmed in 4 cases. 22. May 2013 - WHO: the yellow fever ‘booster’ vaccination given ten years after the initial vaccination is not longer recommended by the WHO. What changes for travelers ? Because the health authorities of all YF endemic countries will have to first ratify the new WHO recommendations, all travellers requiring YF vaccination proof at immigration/transit (according to the international health regulations) will still need to be vaccinated within the last 10 years. Therefore the obligatory YF vaccination regulations remain unchanged. For travelers visiting YF endemic countries where YF vaccination is recommended but not obligatory a booster dose of YF vaccine is not longer recommended if the traveler had been vaccinated in the past. (Exceptions for immunocompromised patients etc. remain unchanged). An expiry date of the YF immunisation protection is not longer recorded in the vaccination passport. Solely the date of the validity of YF protection is recorded. Background: As of May 2013, a total of 40 people in Saudi Arabia, Qatar, Jordan, the United Kingdom (UK), the United Arab Emirates, and France were confirmed to have respiratory illness caused by a novel (new) coronavirus. Twenty of these 40 people died. In the UK, an infected man likely spread the virus to two family members. He had recently traveled to Pakistan and Saudi Arabia and got sick before returning to the UK. In Saudi Arabia, two health care providers were infected after caring for patients who had novel coronavirus. Clusters of cases in Saudi Arabia, Jordan, the UK, and France are under investigation. Background: (see posting from 6., 12., 26. March 2013 below) From September 2012 to date, WHO has been informed of a global total of 31 laboratory confirmed cases of human infection with nCoV, including 18 deaths. Based on the current situation and available information, WHO encourages all Member States (MS) to continue their surveillance for severe acute respiratory infections (SARI) and to carefully review any unusual patterns. The newest case re-emphasizes the need for vigilance in recent travelers returning from areas affected by the virus and the need to use lower respiratory tract specimens for diagnosis when they can be obtained. WHO does not advise special screening at points of entry with regard to this event nor does it currently recommend the application of any travel or trade restrictions. Just published in NATURE: 'The global distribution and burden of dengue' ( Reference): The authors undertook an exhaustive assembly of known records of dengue occurrence worldwide and used a formal modelling framework to map the global distribution of dengue risk. The authors then paired the resulting risk maps with detailed longitudinal information from dengue cohort studies and population surfaces. The authors estimate the total worldwide burden of dengue to be as high as 390 million infections per year, which is more than three times the dengue burden estimate of the World Health Organization. 3. Anhui Female 35 y. Symptoms onset 15/03. Hospitalized in Jiangsu. Severe condition. 4. Jiangsu Female 45 y. Symptoms onset 19. February 2013. Critical condition. 5. Jiangsu Female 48 y. Symptoms onset 19. February 2013. Critical condition. 6. Jiangsu Male 83 y. Symptoms onset 20. February 2013. Critical condition. 7. Jiangsu Female 32 y. Symptoms onset 21. February 2013. Critical condition. 8. Zhejiang Male 38 y. Symptoms onset 7. March 2013. Died on 27. March 2013. 9. Zhejiang Male 67 y. From Hangzhou. Hospitalised 25 March 2013. 10.Zhejiang Male 64 y. Symptoms onset 29 March, Hospitalised 31 March 2013. 11.Jiangsu Male 48 y. Died on 4. April 2013. Background: Coccidioidomycosis (commonly known as "Valley fever", "California fever", "Desert rheumatism", or "San Joaquin Valley fever") is a fungal disease caused by Coccidioides immitis or C. posadasii. It is endemic in certain parts of Arizona, California, Nevada, New Mexico, Texas, Utah and northwestern Mexico. C. immitis resides in the soil in certain parts of the southwestern United States, northern Mexico, and parts of Central and South America. The spores, known as arthroconidia, are swept into the air by the wind and the frequent dust storms occuring in these regions. Infection is caused by inhalation of the particles. The disease mostly presents as an influenza-like illness with fever, cough, headaches, rash, myalgias, and arthralgias and is not transmitted from person to person. According to the CDC 30-60% of people who live in a region where the fungus is endemic will breathe it in at some point. An estimated 150.000 people are infected every year, but many don't know they have anything other than a cold, and they get better on their own. The elderly and other people with weakened immune systems, such as HIV patients, are especially vulnerable. According to the University of Arizona, 60% of those infected don't suffer any symptoms, and another 30% have just mild to moderate infections. 5 - 10% may suffer from complications, and 1% of victims die. In immunocompetent patients the infection ordinarily resolves spontaneously. Antimicrobial therapy is mostly reserved for severe cases (mostly for immunocompromised individuals, in whom the disease can manifest in a disseminated form). In December 2008, the Indonesian Ministry of Agriculture reported a rabies outbreak in dogs on the island of Bali, Indonesia, to the World Organization for Animal Health after the 1st human cases were reported in Denpasar and Badung districts in November 2008. On 25. March 2013, an outbreak of dengue was reported in the port of Mombasa in southern Kenya (with at least two cases confirmed by the Kenya Medical Research Institute). The serotype and the total number of confirmed / suspect cases are not yet known. The Robert Koch Institute informed the WHO of a new confirmed case of infection with the novel coronavirus (nCoV). The patient was a 73-year-old male from United Arab Emirates, who was transferred from a hospital in Abu Dhabi to Munich by air ambulance on 19 March 2013. He died on 26 March 2013. The patient, a 39-year-old male, developed symptoms on 24 February 2013. He was hospitalized on 28 February 2013 and died on 2. March 2013. - Saudi Arabia: 8 cases (6 deaths). - Jordan: 2 cases (2 deaths). - UK: 4 cases (1 patient from Qatar - under treatment, 3 patients from UK - one with history of travel to Saudi Arabia and Pakistan prior to illness; 1 under treatment, 1 recovered, 1 death). An outbreak of muscular sarcocystis-like illness among travelers visiting Tioman Island, Malaysia has been evidenced since summer 2011. As of November 2012, GeoSentinel has been notified of 100 reported patients with suspected muscular sarcocystosis [ Reference]. Starting in summer 2011, 35 patients were identified by early 2012 and traveled there mostly during July and August 2011. The epidemic is currently ongoing, with a 2nd wave of 65 reported new diseased travelers returning since summer 2012. A cluster of 12 patients returning from Peninsular Malaysia since late August 2012 were seen and followed in Bordeaux, France. In the period of September-October 2012, 12 patients (7 male, 5 female; aged 11-46 years) were referred to the Division of tropical medicine, University Hospital Center, Bordeaux, France, with febrile myalgia, unexplained blood eosinophilia, elevated CPK levels, and negative trichinellosis serology. Cases spent their vacation from 26 Jul to 25 Aug 2012 on the east coast of peninsular Malaysia. All patients belonged to a tourist group from southwestern France. The group was composed of 4 families. Almost all patients presented high-grade fever, fatigue, headache, moderate-to-severe myalgia, and arthralgia. Three cases experienced febrile illness for more than 14 days. 2 patients had suffered from diarrhoea and extensive maculo-papular rash. A muscle biopsy from one patient revealed intense myositis, but no intramuscular cysts. Half of patients healed using usual analgic treatments. 6 patients were given empirically albendazole 400 mg twice a day for 7 days and oral prednisone (0.5 mg/kg/day) for 3 days tapered over 2 days. 6 weeks later, 4 patients have still not recovered and were experiencing prolonged asthenia and myalgia. The patients were effectively treated with additional prednisone 0.5 mg/kg/day for 5 days and decreasing dosage over 14 days. By February 2012, one patient relapsed with musculoskeletal complaints. The Ministry of Health in Saudi Arabia has informed WHO of a new confirmed case of infection with the novel coronavirus (NCoV). A 69-year-old male, was hospitalized on the 10th Feb 2013 and died on the 19th Feb 2013. Preliminary investigation indicated that the patient had no contact with previously reported cases of NCoV infection and did not have recent history of travel. To date, WHO has been informed of a global total of 14 confirmed cases of human infection with NCoV, including 8 deaths; giving a case fatality rate of 57 percent. Of the total number, 7 cases, including 5 deaths, have been reported from Saudi Arabia. WHO encourages all Member States to continue their surveillance for severe acute respiratory infections (SARI) and to carefully review any unusual patterns. As the total number of confirmed cases to date is small (14), the observed CFR of 57% may be a reflection of non-confirmation of milder illness associated with infection with this nCoV. - Saudi Arabia: 7 cases (5 deaths). A man coming from Nepal after a 3-month travel is in medical isolation in South Texas, and is the 1st person to cross and be held in detention while infected with one of the most severe types of drug-resistant tuberculosis known today. He has been traveling for 3 months through 13 countries from Nepal through South Asia, Brazil, Mexico, and finally into Texas. His TB is resistant to at least 8 of the 15 or so standard drugs, according to a U.S. government. His XDR strain has been seen only once before in the U.S., in another patient of Nepalese origin, according to the government description. The Nepalese patient was taken into custody by the U.S. Border Patrol in late November 2012 as he tried to cross the border illegally near McAllen, Texas. Given how far and wide the patient ventured, he took a flight of more than 8 hours to Brazil and also traveled by car, boat and on foot, his case was reported to the WHO as having potentially widespread public-health impact. The WHO's Stop TB Department said it is working with the CDC to inform affected countries about people who may have been exposed to the man. On 21 and 27 February 2013, the Cambodian Ministry of Health reported to WHO two new human cases of A(H5N1) influenza in Kampot and Kampong Cham provinces respectively. The case reported in Kampot province was a 20-month old boy with onset of symptoms on 6th Feb 2013, hospitalization on 18th Feb 2013, and who died on 19th Feb 2013. The case reported in Kampong Cham province was a 35-year old man with onset of symptoms on 8th Feb 2013, hospitalization on 13th Feb 2013, and who died on 25th Feb 2013. Both of them have been exposed to poultry. These two cases are the 8th and 9th case reported in Cambodia since the beginning of 2013. There is no epidemiological link between these two cases. Since 2003 a total of 30 cases have been confirmed in Cambodia, including 27 deaths. A 53-year-old female traveller developed fever with headache, arthralgia, and exanthema in combination with lymphadenopathy and mild hepatitis 3 days after returning from an 18 day trip to Bali in December 2012. Laboratory diagnostics showed leucocytopenia, thrombocytopenia, and mildly elevated transaminases. Spite of negative serological results for chikungunya and dengue virus the PCR-result for chikungunya virus was positive. The virus strain could successfully be isolated by cell culture; molecular characterization of the isolated chikungunya virus is in progress. A second sample for serological follow up study 47 days after the 1st examination showed seroconversion for chikungunya virus with high titres for IgM- and IgG-antibodies. No serological evidence for a coinfection with dengue virus was found. The patient flighted directly from Germany to Bali. She predominantly stayed in the coastal region around Semenyak with excursions in the regions around Ubud. She reported several mosquito bites during her holidays but no clinical symptoms in Bali. Currently the patient still complains of headaches and arthralgia. While chikungunya fever cases in Indonesia seem to be frequent in Central and Western Java, there have been only sporadic reports from Bali so far. Travellers should be advised to apply preventive measures (such as, protection from mosquito bites) when visiting Bali. Philippines (Antique province): 33 cases; deaths 1. Singapore: 232 cases in 2 urban areas; other areas 29 clusters. Australia (Cairns, northern Queensland state): since December 2012, 64 cases. Spreading. 2 separate outbreaks; dengue virus types 1, 3. Kenya (North Eastern province): An outbreak of dengue fever in northern Kenya (Mandera District), along the Ethiopian and Somali borders, is drawing attention to the need for improved health services in some of the country's most remote communities. 3 suspected dengue deaths have been recorded, and there are fears that more cases have gone unreported. In 2011, an outbreak of dengue fever infected up to 5000 people. Somalia (Mogadishu city): 28 cases. Mexico: First 5 weeks of 2013, a total of 1061 cases; DHF/serious 355 cases; States most affected: Guerrero 209 cases, Veracruz 118 cases Michoacan 106 cases. Argentina: 834 suspected cases, 22 confirmed cases. Bolivia (Beni department): 2,537 suspected cases, 560 confirmed cases; 4 deaths; municipalities most affected are Guayaramerin with 235 confirmed cases, Riberalta with 209 cases, and Trinidad with 71 cases. Brazil: Amazonas state with 726 cases; municipalities most affected are Manaus with 515 cases, Tabatinga with 125 cases, and Humaiata with 23 cases. Bauru, Sao Paulo state: 397 cases. Campinas, Sao Paulo state: 433 suspected cases, 84 confirmed cases; and DHF/serious 1 case. Belo Horizonte, Minas Gerais state: 1,097 suspected cases, 606 confirmed cases. Parana state: 3,150 confirmed cases; outbreaks in 11 municipalities. Rio de Janeiro state: 15,855 suspected cases; DHF/serious 8 cases. Sorocaba, Sao Paulo state: 132 cases; Deaths 1. Colombia: 6,161 cases; DHF/serious 123 cases.Ecuador: 1,929 cases in 19 provinces; DHF/serious 19 cases; Deaths 4. Paraguay: 23,917 suspected cases, and 14,518 confirmed cases. Venezuela: 6,185 cases; DHF/serious 328 cases; States with outbreaks: Lara, Portuguesa, Barinas , Trujillo. Saudi Arabia: The Ministry of Health in Saudi Arabia has informed WHO of another confirmed case of NCoV infection. The patient was hospitalized on the 29th Jan 2013 and died on the 10th Feb 2013. The case was laboratory-confirmed on the 18th Feb 2013. Further investigation into this case is ongoing. UK: Health Protection Agency continues to investigate the family cluster where 3 members of the family tested positive for NCoV infection. One member of this family, who had an underlying health condition, has died. A total of 13 NCoV human cases have been confirmed by WHO, including 7 deaths. WHO encourages all Member States to continue their surveillance for severe acute respiratory infections (SARI) and to carefully review any unusual patterns. Testing for the NCoV should be considered in patients with unexplained pneumonias, or in patients with unexplained, severe, progressive or complicated respiratory illness not responding to treatment, particularly in persons traveling from or resident in areas of the world known to be affected. The Health Protection Agency continues its investigations into a family cluster of novel coronavirus infections in the UK. Three members of the same family have all tested positive for novel coronavirus. Two of these had no history of recent travel, suggesting that transmission has occurred in the UK. One person has died. This patient had an underlying condition that may have made them more susceptible to respiratory infections. The 1st patient in this cluster, who had recent travel history to Saudi Arabia and Pakistan, is still receiving treatment. The 3rd case, who had a mild illness, has recovered. Since September 2012, when an earlier case was diagnosed in the UK, there have been a total of 12 confirmed cases of novel coronavirus reported globally, with 6 deaths. Intensive work has been carried out in the UK to identify contacts of the UK cases. In total, the HPA has identified and followed up on more than 100 people who had close contact with the cases in this recent family cluster. Besides the identified secondary cases, all tests carried out on contacts to date have been negative for the novel coronavirus infection. The recent UK experience provides strong evidence of human-to-human transmission in at least some circumstances and it's an important opportunity to obtain more information about the characteristics of this infection in humans and risk factors for its acquisition, particularly in the light of the 1st ever recorded instance of apparently lower severity of illness in one of the cases. The risk of infection in contacts in most circumstances is still considered to be low, and the risk associated with novel coronavirus to the general UK population remains very low. The HPA will continue to work closely with national and international health authorities and will share any further advice with health professionals and the public if and when more information becomes available. Mexico- 1,061 cases; DHF 355 cases. Honduras (Olanch department). 50 cases, and increasing. Dominican Republic- 1,323 cases; 3 Deaths. Puerto Rico- 10,028 suspected cases, 467 confirmed cases; Dengue virus type 1 (79% of total cases), type 4 (21%), and increasing. Bolivia- Cochabamba department: 9 confirmed cases, 126 suspected cases. Santa Cruz department: 40 confirmed cases; Deaths 1 (due to Dengue virus type 4 infection). Brazil- Sorocaba, Sao Paulo state: 132 confirmed cases; Deaths 1, and increasing. Brazilia Federal District: 638 suspected cases, 160 confirmed cases. Goias: 20,793 reported cases. Goiania: 11,604 cases. Minas Gerais: 29,517 cases, 2 deaths. Parana: 3,439 cases. Ecuador- 722 cases; 2 deaths. Paraguay- 34,612 suspected cases, 13,044 confirmed cases; 26 confirmed deaths and 12 suspected deaths; Dengue virus type 4 present. Venezuela- Carabobo state: 38 suspected cases; and increasing. Philippines (Misamis province)- 1,356 cases; 21 deaths. India (Mumbai, Maharashtra state)- 94 cases; and increasing. Pacific New Caledonia- Jan 2013: 965 cases, February 2013: nearly 500 cases; Deaths 1. The Japan Health Ministry announced on the 13th Feb 2013 that 2 more people have been confirmed dead due to a viral infection transmitted by a mite bite. Total deaths caused by this virus infection are now 3. They died last fall 2012 from the infection, known as severe fever with thrombocytopenia syndrome (SFTS). They had no recent record of overseas travel. First case of SFTS was reported in China around 2009. Genetic studies showed the virus that killed the 3 Japanese occurred in Japan and did not come from China. The UK Health Protection Agency confirm a further case of novel coronavirus infection in a family member of the case announced on 11 Feb 2013. The patient, who is a UK resident, does not have any recent travel history and is currently receiving intensive care treatment at The Queen Elizabeth Hospital, Birmingham. This patient has an existing medical condition that may make them more susceptible to respiratory infections. This latest case brings the total number of confirmed cases globally to 11, of which 3 have been diagnosed in the UK. Confirmed novel coronavirus infection in a person without travel history to the Middle East suggests that person-to-person transmission has occurred and that it occurred in the UK. Although this case provides strong evidence for person to person transmission, the risk of infection in most circumstances is still considered to be very low. If novel coronavirus were more infectious, a larger number of cases would have been diagnosed since the 1st case was reported 3 months ago. Therefore, the risk associated with novel coronavirus to the general UK population remains very low. Coronaviruses are causes of the common cold but can also include more severe illness, such as SARS (severe acute respiratory syndrome). This new coronavirus was 1st identified in September 2012 in a patient who died from a severe respiratory infection in June 2012. The virus has so far only been identified in a small number of cases of acute, serious respiratory illness who presented with fever, cough, shortness of breath, and breathing difficulties. China: One of 2 avian influenza A/(H5N1) infected people died of a multiple organ failure in a hospital in southwest China's city of Guiyang on 13th Feb 2013. Epidemic control experts have not found any indication that the patients had close contact with birds, nor have they found any epidemiological connection between the two cases. People who have had close contact with the 2 patients have been put under medical observation. None have exhibited symptoms. CDC of Taiwan revealed on the 31st Jan 2013 that a 48 year old man had been infected with Angiostrongylus cantonensis after eating undercooked snails. According to the CDC, the man had snail soup with 5 of his friends a few days before exhibiting symptoms of headaches and neck stiffness. The patient is still undergoing medical treatment in a hospital. His friends, who had snail soup with him, have not shown any symptoms of infection. Two more deaths caused by Nipah virus infection were reported on 27th of Jan 2013. Total deaths in 2013: 8. New deaths were from Pabna and Rajshahi. An outbreak of Lassa fever in Lafia, the capital of Nasarawa State, was confirmed last week. Three cases with one fatality case have been reported. All of them were neighbours in Tudun Gwandara, an over-populated and one of the dirtiest sections of the metropolis. Lassa fever is an acute viral illness that occurs in West Africa and it was named after the town in Nigeria where the first cases were originated. Lassa fever virus is a member of the virus family Arenaviridae, a single-stranded RNA virus, and is zoonotic. Lassa fever is mild or asymptomatic in about 80 percent of people but the remaining 20 percent have a severe multisystem disease. Lassa fever is also associated with occasional epidemics, during which the case-fatality rate can reach 50 percent. The reservoir, or host, of Lassa virus is a rodent known as the "multimammate rat" of the genus Mastomys. Lassa fever may also spread through person-to-person contact. The death rates are particularly high for women in the 3rd trimester of pregnancy, and for fetuses, about 95 percent of which die. Ribavirin has been used successfully in the treatment of Lassa fever patients ( Reference). India (Pune, Maharashtra state): Dengue in 2013: 32 cases; Deaths 2. Philippines (Cebu city): Dengue in 2013: 115 cases. Australia (Cairns, North Queensland). Dengue in 2013: Whitfield area 30 cases; Mount Sheridan 7 cases; Dengue virus type 1. France: more than 23,000 cases of measles including 6 deaths were reported in France between 1 Jan 2008 and 16 Jan 2013, according to data released by l'Institut de Veille Sanitaire (The Institute of Public Health). The greatest incidence is affecting southwest area. Last year 2012, 859 cases were reported with 3 cases of encephalitis and 32 cases of severe pneumonia. England (North-East): almost 50 cases of measles were confirmed in recent months (since Sptember 2012). The Health Protection Agency urged adults to check whether they and their children are protected with 2 doses of MMR vaccine. The majority of cases are in unvaccinated school children and young adults with >50% of the cases aged between 10 and 30 years. Most of these cases could have been avoided if people had been up to date with MMR vaccination. The HPA is advising people with symptoms to stay away from school or work until at least 4 days after a rash has appeared. Nigeria (Kebbi): Nigeria is one of the countries with highest number of unvaccinated children against measles. WHO stated 1.7 million Nigerian children did not receive the 1st dose of the MMR vaccine in 2011. 23 cases of measles in Rawalpindi. According to the WHO, more than 300 children have died from measles in Pakistan in 2012, a 5-fold increase from 2011. This situation is further evidence of the crisis in medical care in Pakistan. Rawalpindi is a city in the Pothohar region of Pakistan near the country's capital city of Islamabad, in the province of Punjab. Rawalpindi is the 4th largest city in Pakistan after Karachi, Lahore and Faisalabad. 92 cases of measles have been confirmed in Lahore, according to the Health Department. A 10-year-old died of measles at Mayo Hospital's paediatric ward on Wednesday 23 Jan 2013. 40 cases of measles have been reported in Multan. Vaccination teams had been set up to inoculate children in affected areas. 6 new measles patients were reported in Gujranwala on Wednesday 23 Jan 2013. Pakistan (vaccination policy): The Health Department has decided to lower the age of 1st measles vaccination from 9 months to 6 months in areas where cases are being reported. Brazil: The State of Sao Paulo (SP) has had no endemic circulation of measles virus since 2000. However, in 2011, there were 27 measles cases, with 18 of them occurring as 2 outbreaks in schools. Most cases (23) in SP occurred between August and December 2011. There was no record of any confirmed cases of measles in SP during 2012. On Wed 2nd Jan 2013, a suspected case of measles in a 20-year-old resident of the city of Bauru (SP state) with a history of international travel to Florida, USA in December 2012 tested positive for measles virus genotype D8 by RT-PCR and sequencing performed at Fiocruzon on the initial sample (2 Jan 2013). Measles virus genotype D8 is circulating in England and has been detected in other countries, including the USA, Canada and China. On Wed 9 Jan 2013, a traveler living in Minas Gerais, who returned on the same flight, presented with rash and fever. On Thu 10 Jan 2013, 2 family contacts who had accompanied the 1st case also became symptomatic. All cases are under investigation until the final diagnosis. A new GII.4 Norovirus strain was identified in Australia in March 2012. Named GII.4 Sydney, this emergent strain has since caused acute gastroenteritis outbreaks in multiple countries. During September–December 2012, a total of 141 (53%) of the 266 norovirus outbreaks reported to CaliciNet were caused by GII.4 Sydney that appears to have replaced the previously predominant strain, GII.4 New Orleans. Compared with other norovirus genotypes, GII.4 noroviruses have been associated with increased rates of hospitalizations and deaths during outbreaks. Noroviruses are the leading cause of epidemic gastroenteritis, including foodborne outbreaks, in the United States. Hospitalization and mortality associated with norovirus infection occur most frequently among elderly persons, young children, and immunocompromised patients. Noroviruses belong to the family Caliciviridae and can be grouped into five genogroups (GI through GV), which are further divided into at least 34 genotypes. Human disease primarily is caused by GI and GII noroviruses, with most outbreaks caused by GII.4 strains. During the past decade, new GII.4 strains have emerged every 2–3 years, replacing previously predominant GII.4 strains. Egypt/Pakistan: Two sewage samples from Cairo were analysed and found to resemble a recently discovered strain in the Pakistani city of Sukkur. To reduce the possibility of spread of poliovirus beyond Pakistan's borders all children under 5 years leaving the country are being vaccinated against poliovirus at the international departure lounges. Polio cases in Pakistan have risen sharply in recent years, hitting 198 in 2011, according to the WHO. Afghanistan: Total number of WPV cases for 2012: 37. Total number of cVDPV2 cases for 2012: 4. Nigeria: One new WPV case was reported in the past week, total number of WPV cases for 2012: 122. 2 new cases of cVDVP2 were reported in the past week. Total number of cVDPV2 cases for 2012: 8. Pakistan: Total number of WPV cases for 2012: 58. Total number of cVDPV2 cases for 2012: 15. Niger: In the 1st outbreak of polio in 2012 outside of an endemic country or a country with re-established poliovirus, Niger has reported a case of wild poliovirus. This is the 1st case in the country since December 2011 and is related to virus originating in Nigeria. Bolivia: 370 Dengue confirmed cases and 1,560 Dengue suspected cases. The areas most affected are Guayaramern, Beni department, Pando department, and Santa Cruz. Caused by Dengue viruses 1,2,3. Brazil: States affected by Dengue are: Mato Grosso do Sul state with 7,697 cases, increasing with an average of 600 cases per day; Rondonia state with 3,099 cases in 2012; and Peabiru in Parana state with 1,300 cases since June 2012. Colombia (Antioquia department): 74 Dengue cases and increasing. Ecuador: Santo Domingo city (Santo Domingo de los Tsachilas province) with 2,027 Dengue cases in 2012 and one DHF/serious case in 2013; Sucumbios province with more than 110 Dengue cases and 1 death associated to a Dengue suspected case. Paraguay: 9,467 Dengue cases in last 30 days with 7 deaths associated to Dengue confirmed cases and 12 deaths associated to Dengue suspected cases. Venezuela: 48,346 Dengue cases with Anzoategui state affected by 1,743 cases. GlaxoSmithKline (GSK): GSK has announced that Typherix® (Vi polysaccharide typhoid vaccine) and Hepatyrix® (combined hepatitis A and typhoid vaccine) are not currently available. The global supply of these vaccines has been constrained due to a delay in a new manufacturing facility coming on line. Typherix: GSK expects there will be an out of stock situation from late July 2011 until at least the second quarter of 2014. All queries relating to this situation should be directed to the GSK Customer Contact team on 0808 100 9997, or alternatively your local GSK Travel Health Account Manager. As of 18 January 2012, Sanofi Pasteur MSD reports no interruption to existing standing orders. For others, orders can be placed and it is estimated supply will recommence from the end of February 2012. Annual Hajj pilgrimage starting 4th Nov. The annual Hajj pilgrimage to Mekka is starting on 4th November.